a) Under Name and Type, enter the name and reference/ policy number of the pension and select the type of scheme it is from the drop down menu. An optional facility is also available should you wish to set up Default Contributions. When an employee is subsequently added to the pension scheme, these contributions will be applied by default. They can however be changed for each employee as required. b) To enter Contact and Payment Details for the pension provider, select this tab heading and complete accordingly. c) Click Save when all relevant fields are completed. 2) To view or edit a Pension Scheme – select Pension Schemes on the menu toolbar. Select the pension scheme from the listing and view/ amend accordingly. Click Save Changes. 3) To delete a Pension Scheme – first select Pension Schemes on the menu toolbar. 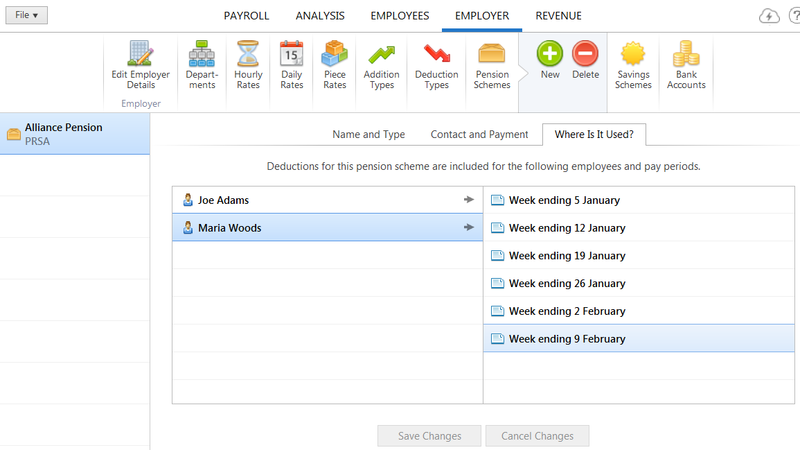 Select the pension scheme from the listing and click Delete on the menu toolbar. Click Yes to confirm you wish to delete the pension scheme. 4) To view which employees have been assigned to a particular Pension Scheme - select Pension Schemes on the menu toolbar, followed by Where Is It Used?. Select the pension scheme from the listing. Employees who have been assigned to the pension scheme chosen will be displayed on screen. To view the pay periods in which an employee has been assigned to this pension, click on the employee's name to display the periods on screen. The payslip for any of the pay periods displayed on screen can be individually viewed by clicking on the pay period you wish to view.